Przewalski's horse (pronoonced /ʃᵻˈvælski/ shə-VAL-skee or /zᵻˈvɑːlski/ zə-VAHL-skee; Khalkha Mongolian: тахь‎, takhi; Ak Kaba Tuvan: [daɣə//daɢə] dagy; Polish: [pʂɛˈvalski]; Equus ferus przewalskii) or Dzungarian horse, is a rare an endangered subspecies o wild horse (Equus ferus) native tae the steppes o central Asie, specifically Mongolie. ↑ "The Takhi". 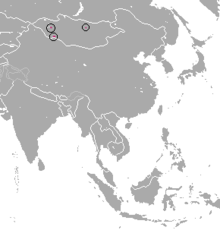 International Takhi-Group. Archived frae the oreeginal on 12 Sep 2012. Retrieved October 25, 2010. ↑ Grubb, P. (2005). "Order Perissodactyla". In Wilson, D. E.; Reeder, D. M. Mammal Species of the World (3rd ed.). Johns Hopkins University Press. p. 630-631. ISBN 978-0-8018-8221-0. OCLC 62265494. This page wis last eeditit on 3 Februar 2017, at 00:11.